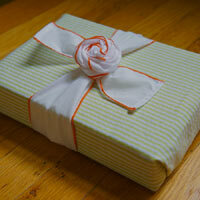 Enfold makes high quality reusable gift wraps out of sustainable fabrics. They are fully lined and currently come in two sizes and prints. The wraps are designed and sewn in Grand Rapids, Michigan. Presents can now be beautifully wrapped simply using the attached ties. No other wrapping supplies are necessary. They also make great gifts themselves. 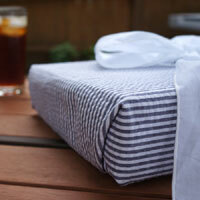 Enfold’s Reversible Reusable Gift Wrap makes gift giving more fun and more beautiful. And to Enfold, fun and beautiful not only means making a product that is easy to use and crafted impeccably, but also one made in a way that is sustainable and ethical. The enfold design involves strategically placed Velcro and lovely fabric ties that allow packages to be secured in a lined fabric wrap and embellished with the attached ties that can be fashioned into a lovely bow.